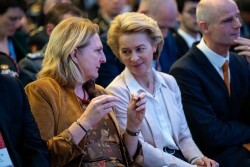 As part of an official visit to Vienna, Ursula von der Leyen, Minister of Defence of Germany, which currently holds the OSCE Chairmanship, will meet OSCE Secretary General Lamberto Zannier. During their meeting, von der Leyen and Zannier will discuss the role of the OSCE focusing in particular on the crisis in and around Ukraine. They will also explore possibilities to strengthen the OSCE and its capabilities.